We were in for a real treat with this morning's assessment... Meet new pup Max! 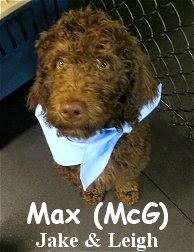 He is an adorable, three month old, fifteen pound, chocolate colored, Multigen, Labradoodle. Max is the new "little brother" (technically nephew) of Fort Fido Medium Roll champion, Lucy (who is a "F1 doodle"). Now Max followed "big sis" Lucy into the medium play area. Once there, he explored cautiously, unsure of what to make of the place. As the pack grew in size, Max started to come out of his shell and really interact. Georgie, and others, helped welcome Max, getting him to gallivant with them. Max had a very positive first day at The Fort, he did a fine job here. We are stoked to have him amongst our ranks. Like it has been watching Lucy, it will sure be awesome to watch, Max, grow into a respected adult canine.